The May 3rd 2006 meeting was conducted by Jim Cook. This was a short business meeting, with no important business to come before the membership. Jack Putnam, treasurer reported on our checkbook balance. He also reported that we have 27 paid up members. Bob Torbet reported that the Spring Shakedown Tour would be held at Indian Lake on May 21st at 10:30. 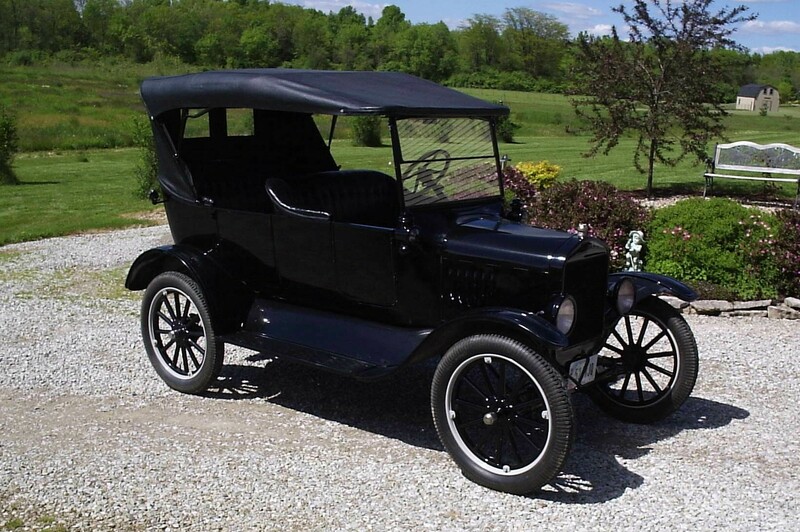 On May 21st, 2006 at 10:00 am, the Model T Club of Northwest Ohio organized a spring shakedown tour. We met at Indian Lake State Park located on State Rte 235 on the north side of Indian Lake. We left at about 10:30 for the trip around the lake. We toured about 39 miles past many beautiful homes and made three stops. The first was just past the covered bridge to the southeast of Indian lake. The next was at the home of one of the Mad River T's. The final stop was at the Tilton Hilton for lunch (yes the floor really is tilting). From that point, everyone was free to go on their merry way. Most of us stayed around for at least an hour entertaining the locals and giving rides with history lessons slipped in to build further interest. The Model T's began to assemble in the parking lot of the Indian Lake State Park. There was a mist in the air and you can see by the coats that it was a bit nippy. Ray Sutton, Bob Torbet, and Bill Sieberg's cars are ready to go. We just had to wait for a few more people to show up. Five minutes earlier, one of the wives suggested that we scrap the tour for the day and reschedule for another day. I simply said that we will run this tour with as many people as show up. Ten minutes into the tour, the skys turned blue and it was a great tour in the sun. Here, we have a couple of pictures of the T's coming out of the covered bridge. Model T's and covered bridges just go together. Tradition has it that you are supposed to kiss the one you love as you go through the bridge. Since I didn't have Sue with me on this particular day, it made for a sad expeience. Maybe next time! breaks allow the general public to get up close to the cars and talk with the drivers. There were a couple of times during the tour when we were talking to people as we were moving. Take it slow and enjoy the ride and let others enjoy the cars at the same time. All in all, Bob Torbet did a great job of organizing this tour. As always, we'd like to see more of our members get their cars out for these one day tours. Ray Sutton commented that he'd like to see the tours be part of the monthly meeting; but alas, we get a better turnout at Jack's place. Ray has agreed to do the July tour and I believe that Melvin is working on the June tour. The August tour will likely be connected to our yearly picnic at Jacks. The Tilton Hilton lived up to its name. The last time that I was in a building that was that far off plumb was at the old Cedar Point Fun House in the 60's. I sized up the situation and sat on the high side of the table. If a drink was going to be spilled, I wanted to be upstream instead of downstream. The meal gave us all an opportunity to get to know one another a little better. Personally, I found out that Bill Sieberg speaks English, French, and German. Another great part of the tour was the three families that represented the Mad River T's. Meeting other Model T families, who are interested in touring, develops friendships that last a lifetime. It also gets the ladies more involved in what we are doing. Once again, thanks to Bob Torbet for a great tour. There should be a lot of tour stories at the June meeting. I have a copy of the registration form for the 18th Annual Ohio Model T Jamboree to be held September 1-4, 2006. Please let me know if you'd like a copy. Last Mother's Day (2005) Dave and Ben Nolting were talking about a Model T touring that they had tracked down and were considering pursuing it. It turns out that they went down to Southwest Ohio the day after the tour to see it and quickly purchased it for reasons of restoration. The guy that sold it was happy that someone intended to restore it for the purpose of touring the car as it was intended. So Ben and Dave set about finding parts and rebuilding the car from the frame up. It was used on a short tour to Columbus. During that trip Ben learned about old rubber. It looked good when they left Ashley; but, it started throwing its rubber shoes in route. Ben also learned something about a good electrical system. An old coil should be rebuilt even if it looks fine and checks out on the tester. All old coils are ready to fail at any time. One year later the car is perfoming flawlessly and Ben has no trouble taking off on his own across country.